«People get scared when they hear the word arsenic because it can be a toxin and carcinogen, but the use of arsenicals as antimicrobials and anti-cancer agents is well established,» says Rosen. In 1908, Paul Erlich won the Nobel Prize in medicine after finding an arsenic-based cure for syphilis. Arsenicals are still used to treat tropical diseases, preventing infectious diseases in poultry, and as a chemotherapeutic treatment for leukemia. According to the Centers for Disease Control and Prevention, around two million people in the United States are infected with drug-resistant bacteria every year, killing more than 23,000. The World Health Organization (WHO) has warned that «a growing number of infections — such as pneumonia, tuberculosis, gonorrhea, and salmonellosis — are becoming harder to treat as the antibiotics used to treat them become less effective.» WHO recently released a global priority list of antibiotic-resistant pathogens that pose the greatest threat to human health. 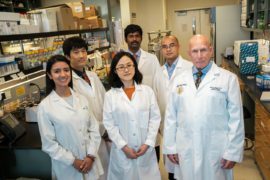 The group of scientists has tested the new antibiotic and found it to be «very effective» against some of the most notorious bacteria affecting public health including E. coli, which can cause severe intestinal infections; and the «last resort antibiotic» carbapenem-resistant Enterobacter cloacae, the culprit of increasing infections in neonatal and intensive care units, and one of the WHO-designated priority pathogens. It also worked against Mycobacterium bovis, which causes tuberculosis in cattle. This suggests the potential for treating human tuberculosis. Further testing will be necessary to determine the antibiotic’s effectiveness and toxicity in animals and humans.